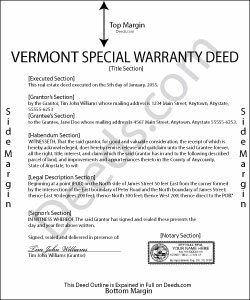 A limited warranty deed can be used in Vermont to convey title to real property. This type of deed is commonly used to convey property acquired through foreclosure. Limited warranty deeds are also used when a seller is unwilling to give a full warranty deed and the buyer is not willing to accept a quitclaim deed. There are no statutory deed forms for this state; common law legal language should be used in creating a limited warranty deed. The grantor in a limited warranty deed covenants that he is in lawful possession of the premises being conveyed and has good right and title to convey the same. There is also a covenant from the grantor to warrant and defend the title against all lawful claims and demands of persons claiming by, through, or under the grantor. A limited warranty deed in Vermont must be signed by the grantor and acknowledged by the grantor before a town clerk, notary public, master, county clerk, judge, or register of probate before it can be recorded. An acknowledgment before a notary public in Vermont will be valid without an official seal being affixed to the notary's signature (27 341a). Notarial acts can be performed in Vermont or in another state. If a deed is acknowledged out of state according to the laws of such state where the acknowledgment is taken, the deed will be valid for recordation in Vermont. Out-of-state acknowledgments can be taken before any of the officers listed in 27 379. Land records in Vermont are handled at a local level, which means that limited warranty deeds and other conveyances of real property are recorded in the town or city where the property subject to the deed is located. Until a limited warranty deed is signed, acknowledged, and recorded, it will not be effective to hold such lands against any person but the grantor and his or her heirs ( 342). Lindsey W. said: The service was great but after I did all my work and uploaded the documents they canceled my stuff because the county they had on the list doesnt take/or have set up e-recording yet. It was a bit disappointing because thats the only reason I was on here is because it brought me here from that countys sight. Reply from Staff: Thank you for your feedback, sorry we were not able to provide the service for you. Hope you have a great day.